(A portion of the final section of the post below relating to the manner in which ice was harvested nearly a century ago was written by my late grandfather, Jim Maddigan, who like many residents of the Star Mill neighborhood worked on the Pratt Farm for a period of time). In the past, in Middleborough and Lakeville, January and February meant the start of the annual ice harvest. During the 19th century, as increasingly fewer houses were equipped with root cellars or springhouses to prevent food spoilage, ice began to be harvested in commercial quantities for use in ice chests. Yet, the commercial possibilities of the Middleborough and Lakeville ponds initially seem to have gone largely unnoticed within the two communities. In the late 1860s, when a proposed railroad line from Middleborough to New Bedford was surveyed, it was the New Bedford Standard, which first realized the potential for New Bedford becoming the largest ice market in the country, supplied by ice from Middleborough and Lakeville. The railroad was never built, and the wealth from Nemasket's ponds remained unexploited until 1881. In that year, John Baylies LeBaron (1845-1918) organized the John B. LeBaron Ice Company as a wholesale and retail business with his wife's brother Thomas J. Lovell. The two men are said to have realized the potential of the ice industry while fishing on Lake Assawompsett in December, 1880, a realization which prompted them to build Middleborough's first commercial ice house at Lakeside on Lake Assawompsett near the Lovell Farm. Prior to that time, ice was commercially available in Middleborough typically only through "victuals" dealers like J. Scott Barden, Matthew Cushing and David Tucker who operated meat and fish markets which required ice to preserve their goods. Large quantities of ice were harvested - in 1876 Tucker harvested nearly 600 tons - and the excess was readily sold to the public. 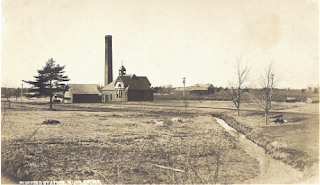 The LeBaron Company tapped into the growing public demand for ice and prospered well enough to build a second ice house at Nevertouch Pond on the west side of Middleborough in 1883. Upon the 1884 death of his father John Burt LeBaron, owner of the LeBaron Foundry Company on Vine Street in Middleborough, LeBaron sold his interest in the ice company to another brother-in-law, Samuel S. Lovell, in order to take charge of the foundry with his own brother, Eugene P. LeBaron. Two years later, however, LeBaron sold his share of the foundry business to his brother, and reentered the ice business by purchasing the interests of Charles C. Thomas who operated at Clark's Springs off what is now Clark Street East. LeBaron built a profitable business, purchasing smaller competitors throughout town, and by the turn of the century had five ice houses at Clark's Springs. In 1906, according to a report in the Middleboro Gazette, "J.B. Lebaron cut about three tons of ice at Clark's Springs the latter part of last week, making five hundred tons he has housed this winter." The subsequent winter, in 1907, he cut about one thousand tons in one week, an equivalent of a full acre of ice twelve inches thick. The ice at Clark's Springs was harvested from a pond known as LeBaron's Ice Pond which, besides being the source of LeBaron's ice, was a popular ice skating venue in winter. In later years, the pond was substantially altered by loam removal by the Thomas Brothers Company, and it has since dried up. (A portion of the area is now largely occupied by the ramp for Route 495). LeBaron ran a profitable business though one which was occasionally hampered by setbacks. The first was the so-called ice famine of 1890 during which local ponds failed to freeze. Finally, in March of that year with no prospects of producing ice locally, LeBaron, in conjunction with Robert H. White of the Brockton and Taunton Ice Companies, took a team of men and a railroad carload of lumber to Winchendon where they erected an ice house, and cut and stored an entire season's worth of ice which was shipped to the Middleborough depot as needed throughout the following summer. (Such "droughts" were a cause for common concern among ice dealers, so dependent were they upon the weather for their crop. In February, 1906, many local ice men were concerned about the prevailing warm weather. Fortunately for them, it broke, and they were able to harvest that winter). 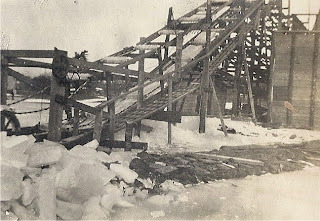 Yet another setback for LeBaron was in August, 1900, when while constructing a new ice house at Clark's Springs, LeBaron and two other workers fell 25 feet when their staging collapsed, leaving LeBaron with "wounds on his arms and body and loosened teeth." Most seriously of all, however, was the disastrous fire of December 31, 1909, in which LeBaron lost all five of his Clark's Springs ice houses. Though the houses were empty at the time - the harvest had yet occurred - the loss was great. Undaunted by this setback, LeBaron rebuilt the business. Following LeBaron's death in 1918, the business was operated by LeBaron's daughter, Hattie LeBaron, who upgraded the machinery, erected new houses and added the sale of fuel oil to the business in 1932. The company remained one of the two largest firms retailing ice in Middleborough (the other being the Ernest S. Pratt Company), and the quantity harvested by Miss LeBaron in 1930 - 3,000 tons - was an indication of how greatly the market for ice had increased over the preceding half century. One of the means by which John B. LeBaron built his business was through the purchase of smaller ice firms in Middleborough like that of Charles C. Thomas. Several small firms operated at various times in Middleborough, taking advantage of the numerous ponds throughout the vicinity. Another such dealer was John C. Chace, who in 1893, leased a piece of land and constructed an ice house on the upper pond at the back of the present Pratt Farm Conservation area on land then owned by the Weston family. The Chace business was sold successively to William Hayward of Halifax and then to LeBaron. My grandfather Jim Maddigan later recalled the remnants of the Chace operation where “on the south side of the larger pond [at the Pratt Farm Conservation Area] there was an ice house, possibly erected and used in conjunction with the ice business of John C. Chace, a carpenter and builder, who leased the pond…. I can remember fishing in these ponds in the 1920s and at that time the ice house was old and weather-beaten to a point where it was unsafe to enter. Eventually it was blown down in a windstorm.” Likewise, Lyman Butler wrote in 1978 this same ice pond was used by Alcide and Edward Dubois who operated Dubois Brothers as a retail ice dealer for a short period from 1907 through 1920, probably having acquired it from LeBaron. In 1920, the pond and surrounding land was purchased by Ernest S. Pratt as it served as the headwaters of his own ice pond. John McNally was another small ice dealer who sold ice at the turn of the last century. McNally in 1899 constructed an ice house at Clear Pond in Lakeville and harvested his ice there. Like many small-time ice dealers, McNally also retailed loam and gravel, and performed teaming work. Later, in the 1920s, A. R. Salley and Scudder Brothers Coal Company also established short-lived ice operations. Many local residents and businesses, however, saw no need of purchasing ice from these retail dealers as many were able to harvest enough of their own ice to supply their needs throughout the subsequent summer. Clifford R. Weld, W. F. Leland and Henry A. Wyman, owners of estates along Marion and Long Point Roads, had ice harvested for their own personal use and housed in private ice houses, while businesses such as the King Philip Tavern at Lakeville and Kinsman Brothers in Middleborough likewise secured their own supplies. Another noted Middleborough dealer in ice was Ernest S. Pratt (1885-1964). In December of 1908, the Ernest S. Pratt Company was formed to harvest and sell ice with Luther B. Pratt, Ernest S. Pratt and Henry E. Standish (Ernest Pratt’s father-in-law) as partners, and inauguration of the business was announced in the local newspaper the following month: “There is to be a new ice man in town next summer. Ernest S. Pratt is building an ice house near the Pratt homestead on East Main street, and will fill it with ice this winter.” In just a short period of time, the Pratt Company would become the leading competitor to the LeBaron Company in Middleborough. A large ice house was constructed on the edge of the pond in 1909 in order to house each winter’s harvest, and in 1911 when Arthur R. Coffin joined the company, an additional ice house was erected to facilitate the growth of the business. 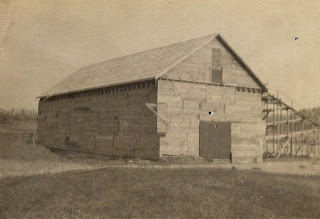 Paul Carter, a one-time employee of Pratt, later described the construction of the original 1909 ice house and the subsequent ones built near it. According to Carter, cedar posts were simply inserted upright into holes in the ground forming the perimeter of the ice house. Boards were then hung horizontally on opposite sides of the posts, forming an 18 inch deep hollow wall which was later filled with saw dust as insulation. “Then of course … a plate was put on top and the roof was put on… Rafters [were] put up and purlins every three feet… We used to use cedar shakes on the roof” which were produced on the farm. “It was a very simple structure,” concluded Carter. These ice houses were abandoned when a new ice house was constructed on Stony Brook, and were blown down during the 1944 hurricane. A short time after 1911 the firm expanded by temporarily acquiring the ice harvesting privileges at Tispaquin Pond in Middleborough which were later held by A. R. Salley. Modern harvesting equipment including escalators, or conveyors, to haul the ice into the ice houses was also acquired. With the withdrawal of Coffin in April, 1915, and the deaths of Standish in 1926 and the elder Pratt in 1930, Ernest S. Pratt became the sole proprietor of the company. The maintenance of pure water in the ice pond was critical to Pratt for the production of pure, clean ice, and one of the less savory tasks associated with maintaining pure clean ice was the trapping of animals, primarily muskrats, which might compromise the purity of each season’s harvest. 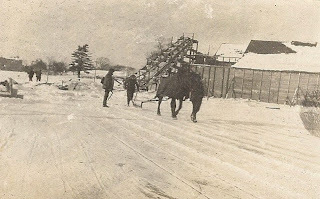 Another issue, as related by Bob Hopkins, Paul Carter’s brother-in-law and also a former employee on the Pratt Farm, was the use of horses during the harvest, which might chose to relieve themselves on the ice. This reputedly irked Pratt who required his employees prevent the horses from heeding the call of nature. They remained at a loss as how to do so, and so did little, undoubtedly much to the annoyance of Pratt. 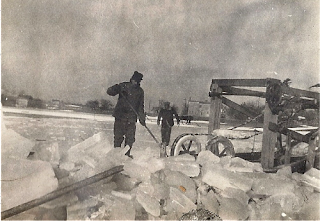 Despite these challenges, ice from the Pratt Farm was noted for its cleanliness and clarity, the Pratt Company’s advertising touting the fact that it was spring water ice, “harvested and delivered by modern and sanitary methods.” (The LeBaron Company, in 1930, was similarly advertising "safe ice"). In the 1930s, the growth of the Pratt Ice Company’s business as well as the physical deterioration of the existing ice houses on the farm warranted the creation of a new ice pond and the construction of a new ice house. The site chosen was located on Stony Brook on land adjoining the Pratt Farm which was acquired for the purpose in 1928. The entrance to these ice houses was about a quarter of a mile north of the Pratt House and barn, on the south side of East Main Street, though they could also be reached from the farm. The buildings were a little smaller than those at the farm, but the filling of the new ones was similar to the methods used at the older houses. The first operation in preparing the Stony Brook site for the new pond and ice house was the clearing of the trees and brush from an area of about three acres around the confluence of Stony and Morey Brooks which formed the water source for the new pond. The location selected was ideal as it was surrounded by high ground on three sides, and a narrow space between the hills where the Stony Brook had its outlet, making a choice spot to build the dam. There was an opening left in the dam where planks could be lowered to control the level of the pond. The surrounding hills would also prove beneficial in limiting the exposure of the pond to the elements, thereby encouraging the quicker formation of ice upon the pond. At the time, the so-called “large ice house” which measured 80 by 32 feet and stood on the bluff overlooking the ice pond below, with doors opening to the pond and Stony Brook Road, was constructed. A wall divided the house in half lengthwise, creating two large spaces. Because of this arrangement, it is frequently stated that Pratt had two houses here though in fact it was one large house. A wooden conveyor resting upon concrete footings ran perpendicular to the house and lifted the cakes of ice from the pond below into the house. The late Lyman Butler recalled working in these new ice houses following World War II when he would occasionally help with the ice harvest, along with Arthur Wright. Arthur and I were asked to work in the house, packing the cakes in neat lines, keeping a space between each row for air to circulate. Art and another man would most often be the pivot men and when the cake came off the chute they would take a pike and shove the cake to whoever the stacker was. I got the job more often as I was not quite as rugged. The ice cake would be sent sliding over the rows to the spot where it was to be placed. Then I would spin it with my pike to where it belonged. A pinch bar would be used to perfectly place the cake so the rows would be so as to look down through the bottom. We would swap off jobs once in a while to give one another a break. Ralph Creamer was one of our gang nearly all the time we helped out there. We would get a bit behind at times and have to call out to stop the cakes coming in to us. Generally, two houses would be used at a time so operations would not be stopped. This was real rugged work and we slept well after a day’s work. Inside the house it was quite a bit warmer than outside and we worked in our shirt sleeves much of the time. Ralph would sometimes bring in a bottle of wine in the afternoon and we would have a little nip which warmed us up inside. One day Ralph took a bit too much and got kind of unsure of his footing so when he was not looking we, I won’t say I, got the bottle and hid it until after work as we did not want him to slip and break a leg or something. He knew someone hid it and every minute he had a chance he looked everywhere but didn’t find it. After work we gave it back to him. We knew Ernest would not approve of anyone imbibing even a little wine while at work. I guess that some of the workmen on the pond had a nip now and again to fight off the cold. Bob Hopkins also worked during these years harvesting ice for Pratt, recalling ice harvests that occupied about a dozen men, the process taking a couple of months for the houses to fill. Hopkins enjoyed the ice harvest, and like Butler recalled incidences of workers falling into the pond. Hopkins remembered “Pop” Gates falling in, going home to change his clothes and returning undaunted to resume work on the ice. As electric and gas refrigerators gained in popularity, they were added to Pratt's stock, including so-called “coolerators.” Eventually, the New England winters began to get milder and it was difficult to harvest any appreciable quantity of ice. As early as 1931, harvests became noticeably smaller and the harvests of 1931-32 and 1932-33 were relatively dismal, prompting enthusiasm for the subsequent year’s crop. For the past two days [January 3 and 4, 1934] the ice ponds of Ernest S. Pratt on East Main street have been the scene of bustling activities in the harvest of the first real good ice in three years and Mr. Pratt has employed 50 men in cutting and storing some fine clear nine and ten inch ice. The gang was in full swing Thursday when 1100 tons of this summer commodity were stored with a total of 1900 tons up to this morning. The men employed were taken from the unemployment list so that in addition to Mr. Pratt being able to get a very fine harvest he has made it possible to employ these men and put so much more money in circulation in town. With a depreciable decline in the amount of ice able to be harvested annually and the increasing prevalence of electric refrigerators, Pratt’s business began to taper off during the early 1940s. Additionally, mechanically-produced ice began to replace natural ice during this period. Though Pratt gave up ice harvesting in 1949, with Pratt supplying customers with ice purchased from a freezer plant at Taunton and stored in the ice houses here, as well as the small building near the farm office. Ultimately, Pratt retired from the ice business in 1954. Like LeBaron, Pratt initially harvested his ice with a team of horses which plowed, scraped, and marked the ice, before a seasonal gang of men cut it with large handsaws. The object of each year's ice harvest was clear, thick ice. Once frozen, the ice would be checked for thickness by boring holes with two inch augers. As it was necessary for the ice to be able to support the weight of the horses required in the harvest, the ice would not be cut until it reached, on avereage, a thickness of fifteen inches. There were occasions, though very rare, when horse, man and marker fell through the ice when the driver became careless and entered a section with underlying springs that kept the ice thin in that area. Next came the marking of the ice in order to provide uniformly sized sections measuring 22 by 44 inches. The pond was "lined," whereby a line was established between two points and the pond marked with grooves running both parallel and perpendicular to this sited line. Horses drew the guides and markers which created a cross-hatch of two-inch deep grooves. This was later accomplished with the use of a saw rig powered by a small gasoline engine and drawn by a horse. During extremely cold weather, these grooves would be filled with ice chips in order to prevent water from channelling into them and refreezing. The ice would be cut into rafts generally consisting of several cakes each weighing approximately 200 pounds. These cut sections were pulled along on the open water created by the previous cutting by men with long pikes, and maneuvered to the bottom of the conveyor. At the conveyor, a workman on a suspended platform, many times with cold feet, used what was called a needle bar or ice chisel to break apart the cakes of ice along the score marks. These smaller cakes were then fed one by one onto the conveyor and started on their way up the long ramp to chutes that carried them into the ice houses. The conveyor consisted on an endless chain with wooden cross bars spaced about four feet apart and was powered by a gasoline motor through a network of reduction gears. The coldest of any job was this role as switcher as the man generally stood in one location all day with very little exercise except directing the blocks of ice into each house. There were three to four levels in the ice houses at which the cakes could be deposited from the conveyor onto slides that ran the entire length of the houses, each house containing smaller sections of slide which could be joined together by hand and used to carry the ice to different areas inside. A heavy curved steel diverter on the outside rails could be dropped into place at each of the ice houses at each level. As the ice came down the runways, sometimes quite rapidly, especially on the steeper sections of the chute, the cakes would be hooked with a long-handled pike and swung into position. This was a tricky operation and required the wearing of spiked shoes to prevent workmen from being dragged along behind the ice. An entire layer of ice was laid down before the second layer or floor was commenced. When the first house was filled to the level of the lower exterior rails, the second level interior rails were set in place at the second exterior level and the filling and storing operation repeated. This procedure was followed for each house. The top four layers of each stack would be placed in the opposite direction as the piles underneath in order to “bind” the stack. The stack was then covered with marsh hay as insulation. Following warm weather, the marsh grass and top layer of hay would become a sodden semi-frozen mess and it frequently was necessary to chip it away to access the blocks of ice below. The walls and roof of the ice house would be insulated with sawdust from local sawmills, as well as hay. Once filled, the ice house would be boarded and sealed until summer. The ice kept throughout the season, with shrinkage seldomly exceeding one foot throughout the course of the year. While the subject of this photograph was intended to be the East Grove Street Pumping Station of the Middlbeough waterworks, the LeBaron icehouses at Clark's Springs are clearly visible on the far side of the Nemasket River just behind the utility pole at the center of the photograph. 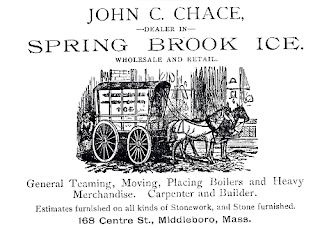 John C. Chace advertisement, from Resident and Business Directory of Middleboro and Lakeville, Mass. for 1895 (Needham, MA: A. E. Foss & Co., 1895), p. 6. John McNally advertisement, from Resident and Business Directory of Middleboro and Lakeville, Mass. 1904-5. (Boston, MA: Edward A. Jones, 1905), p. 22. Built in 1909, the large ice house and a second which was constructed in 1911 served the Pratt Company through the late 1920s when they were superseded by a new icehouse on Stony Brook. This icehouse blew down during a hurricane in 1944. Ernest S. Pratt Company advertisement from Middleboro and Carver, Massachusetts Directory 1934 (North Hampton, NH: Crosby Publishing Co., Inc., 1934), p. 6. The horse, protected against the cold with its woolen blanket, draws the narrow steel marker which lines the ice preparatory to cutting. The resulting evenly-spaced grid is apparent in the foreground. 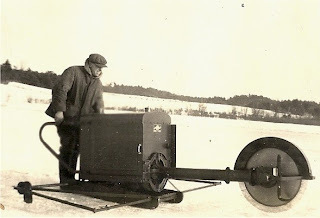 In 1923, Pratt added this gasoline-powered saw to his ice-harvesting eqipment which drastically reduced the effort needed to cut the ice, a task previously performed by hand. The workman at the left is responsible for directing the cakes of ice into the conveyor. In the foreground is the debris left from clearing the ice at the base of the conveyor, as well as undersized and broken cakes.